The board game Go has been around for more than 2,000 years and enjoys widespread popularity in East Asia. But around here, there’s just one game in town. John Russell, a 28-year-old librarian, formed the Tampa Go Club nearly two years ago. The weekly meeting attract upwards of 15 people who play on three board sizes, the largest being the most difficult. Often compared to Chess and Backgammon, Go has simple rules but a high degree of strategy. Two players alternate turns by placing black or white stones on the board to amass the larger territory. The club has a core group of regulars but often gets drop-ins from USF who may have seen the game played in A Beautiful Mind, Pi and other movies. 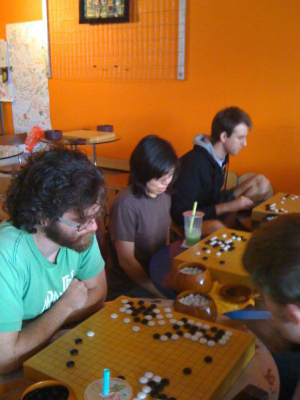 Tampa Go Club meets from 3 to 6 p.m. Sundays at the International Boba House and Internet Cafe, 2764 University Square Drive, Tampa. Click here or email goclubtampa@gmail.com.